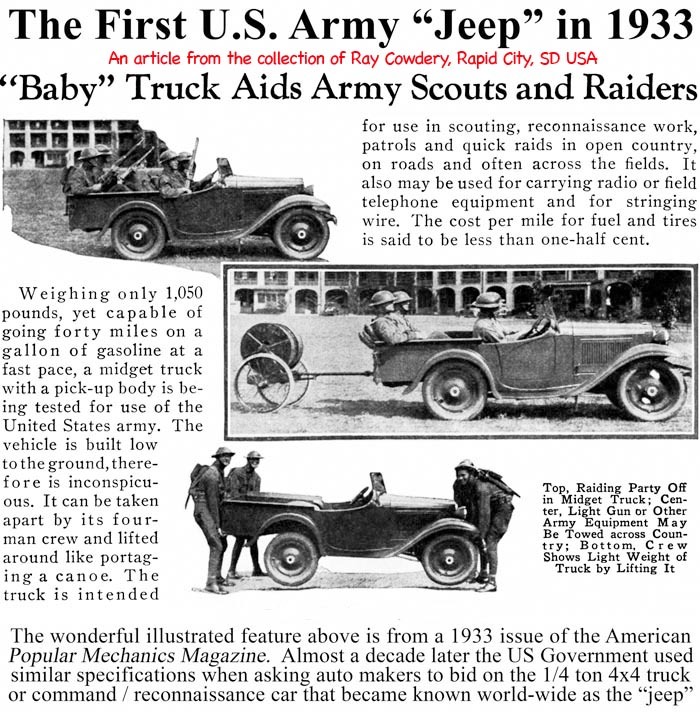 HomeHow the Jeep got its name…..
How the Jeep got its name…..
How the jeep * got its name…..
Few would have guessed when the military jeep was being developed in the early 1940s, that nearly three-quarters of a century later lexicographers and historians would still hotly debate the origins of the name jeep before it had become a brand name or trade name. Nobody needs to debate the etymology of the name jeep as it was applied to World War II American military 1/4-ton 4×4 trucks, as the genesis of that name is crystal clear. In the late 1930s, with the Empire of Japan waging war on its helpless neighbors along the Pacific rim and the Nazi Government of Germany acquiring “living space” by edict in central Europe, American military commanders wisely recognized that the United States would be drawn into any large scale war that developed, and that the American inventory of military weapons and equipment would have to be modernized and vastly enlarged. Among the new vehicles the United States Army wanted to buy in 1940 was a very specific one – a 1/4-ton four-wheel drive tactical “reconnaissance car” to be developed by the Army’s Quartermaster Corps (QMC). At the time, the Quartermaster Corps had responsibility to develop and procure all administrative and tactical general purpose military vehicles – “motor vehicles used for the general hauling of cargo, ammunition, personnel, or equipment,” to use the U.S. Army’s own words. QMC administrative vehicles were essentially commercial vehicles painted in Army olive drab color, and QMC tactical vehicles were always of the all-wheel drive type that could be used off-road. At the same time the U.S. Army Ordnance Department was responsible for the development and procurement of all combat vehicles. Ford Motor Company of Dearborn, Michigan which delivered about 4500 of their model GP prototype. After comprehensive testing of the prototypes, the U.S. Army Quartermaster Corps developed a hybrid version of the 1/4-ton four-wheel drive reconnaissance car. They combined the best aspects of the Bantam, Willys and Ford prototypes and awarded a production contract to Willys-Overland Motors, Inc. for what Willys called their model MB. These vehicles truly were All-American Wonders, and as they proved themselves in the field demand for the new “jeeps” exploded. The United States Government awarded additional contracts to Willys-Overland for more MBs, and new contracts to Ford Motor Company to produce a Ford version of the Willys model MB, the Ford model GPW. Through the summer of 1945 Willys manufactured about 360,000 model MB jeeps and Ford made over 275,000 model GPW jeeps on contracts for the U. S. Government. But why did people call the rugged little quarter-ton truck a “jeep”? Was it because the 1/4 ton 4×4 was one of the Quartermaster Corps’ many “general purpose” military vehicles, and that if one abbreviated “general purpose” as gp and pronounced gp as a word, it sounded like geep or jeep? Well no, that could not be the reason, or people would have referred to all the other Quartermaster Corps general purpose administrative and tactical vehicles as geeps or jeeps too wouldn’t they?! Actually, there were already many “jeeps” in America in 1940 – there was JEEP, the well known Popeye comic strip cartoon character, a heavy Minneapolis-Moline vehicle was known as a jeep, a half-ton U.S. Army truck, and even an aircraft was called a jeep! “Jeep” was a fairly common nickname for boys at the time, like “Butch” or “Buster. The name jeep was in rather wide use for all sorts of things in America in 1940 but was most often applied to someone or some thing that exhibited some of the wondrous characteristics attributed to Popeye’s magical cartoon animal, JEEP. It was perfectly logical then, that when Ford Motor Company came up with their remarkable light weight but powerful quarter-ton 4×4 vehicle designated the GP, that designation was pronounced phonetically in American English as “geep” or “jeep” and it stuck as a name. There are many other cases in which initials are pronounced as words – the letters V.P. (for Vice President) are consistently pronounced “veep” in American English, for example. In the case of vehicles and aircraft it was a predictable certainty that American GIs would abandon the official factory or US Government designation for anything in favor of a more affectionate or lyrical name. The WW II US Army Air Force reference to the B-25 bomber as “Baker Two-Bits” and the universal “Duce-and-a-Half” name for the 2-1/2 ton truck are but two examples. So, why did Ford Motor Company designate their quarter-ton 4×4 prototype GP, while Willys called theirs MA and Bantam called theirs Model 40 BRC? The answer is simple: they did it to avoid confusion within the Army and within Ford as a company. In the very rare 200 or-so page loose-leaf manual “SERVICE SCHOOL FOR U. S. ARMY INSTRUCTORS ON Ford U. S. ARMY VEHICLES * 1941” published by Ford Motor Company, the company explained not only their military vehicles, but the Service Operations, Service Tools and Service Parts required to keep them performing properly. On page 1 of Section D-1 (Service Parts) dated 6-5-41, Ford explained their very logical parts numbering system for the benefit of all those U.S. Army Instructors who attended a Ford Service School. There in black ink on an 8-1/2 x 11 inch sheet of white paper under paragraph heading 2. Prefix the text explains that if the first digit of any Ford part number is a G, the part is for a Government vehicle. It further explains that if the second digit of any Ford part number is a P, the part so numbered is made to fit on an 80 inch wheel base reconnaissance car. Remember, the US Army had nothing to do with the naming of the GP vehicle, only Ford Motor Company did! The name GP had nothing whatsoever to do with Quartermaster Corps’ “general purpose” vehicles period! In Ford factory language, GP designated a single vehicle out of hundreds of types the company had produced. 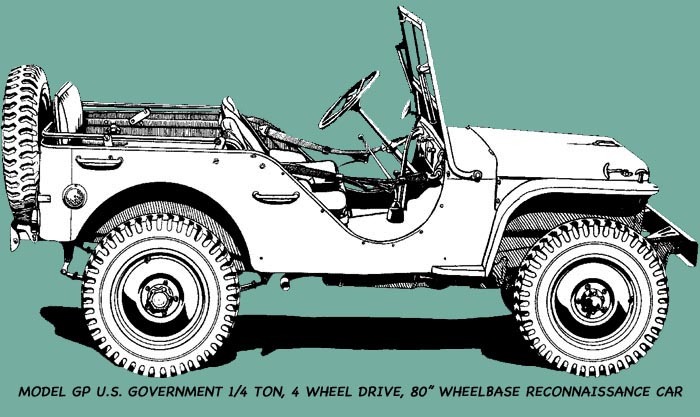 It therefor makes perfect sense that when Ford agreed to produce a clone of the standardized Willys-Overland version of the jeep early in 1942, Ford gave it the designation GPW, for Government 80 inch wheel base reconnaissance car Willys pattern. 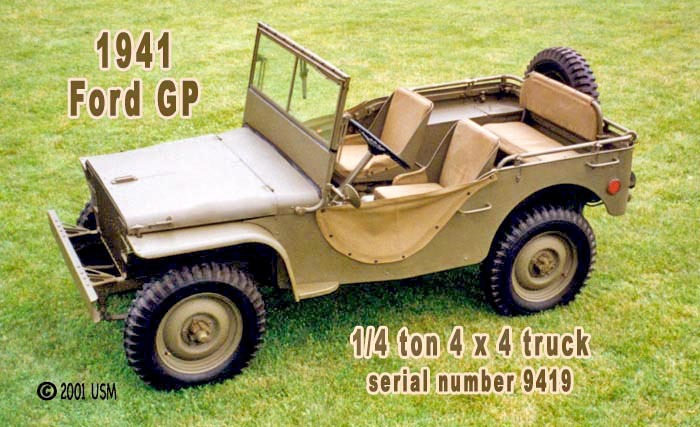 Ford parts made for the GPW were given a number that began with the 3-letter preface GPW, except Ford GP parts common to the Willys MB and the Ford GPW which continued to carry a GP part number. The floating Ford jeep was designated GPA, for Government 80 inch wheel base reconnaissance car Amphibious. So there you have it. No smoke and mirrors, no government jargon, no ambiguity, no doubt whatsoever. GP did NOT stand for “general purpose,” “Grey Poupon,” “great product” or any of the other nonsense to be found in so-called dictionaries, “history books” and on television around the world today. The author of this article, Ray R. Cowdery, served in the United States Marine Corps and lives in the Black Hills of South Dakota with his wife Josephine and cat Pussili. He has bought, sold, traded, torn apart, parted-out, fixed, rebuilt and restored dozens of old WW 2 era military jeeps. Cowdery is the author of the books “All-American Wonder” volumes I and II, and has authored or contributed to many articles on the World War II jeep in magazines such as Smithsonian, Army Motors, Militaria International, etc. Cowdery is intensely opposed to letting the myths of “popular history” (as related in books, magazines, movies and on television) become “real history” for many people simply by the process of repetition. Feel free to link, print, copy or reprint this article and its illustrations if you like, but do not make any changes to the text or any abridgment of it. To change it in any way or to condense it is a violation of the international legal rights of the copyright owner.